2019 is a packed year for those who enjoy anime, comics, gaming, pop culture and cosplay with a number events and gatherings across British Columbia. Don your favourite outfit and join others who share your love for this media with our list of conventions for 2019. The coastline of south-western British Columbia is beautiful jewel, filled with lush islands, sandy beaches and plenty of marine activity. See this amazing landscape from the air in a collection of photos on Gallery. It truly is breathtaking part of our world. The border towns of Mexico are the gateway to this amazing country. Getting around Matamoros in the north-eastern state of Tamaulipas by bus is a world apart from public transit in Canada and the US, but opens up the what this bustling city has to offer. Grey clouds and periods of rain presided over the opening day of the annual Sakura Days Japan Fair in the VanDusen Botanical Gardens, but that didn’t stop festivities. Though many trees had already shed their blossoms, there were a few still in bloom to celebrate this springtime tradition next to an assortment of Japanese food stalls, live entertainment including musical guests from Japan and booths selling traditional clothing and trinkets. Couldn’t make it out or did the rain hold you back? View the rest of photos on Gallery. With 45 million users, Crunchyroll streams anime to all corners of the world and plans to release statistics on a steady basis of what their fans watch and from where. 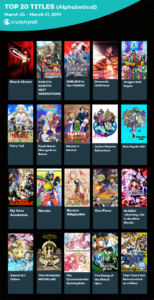 Over a one week period, from March 25th to 31st, 2019, Crunchyroll provided an alphabetical list of their 20 most watched series. As Crunchyroll serves anime fans in over 200 countries, for the week of March 25th to 31st, 2019, the top ten countries per subscriber paints an interesting picture of where the service is being enjoyed. A second season for the anime series The Promised Neverland, based on the manga by Kaiu Shirai and Posuka Demizu, is coming in 2020. The date was unveiled in a short video at the end of the episode that aired on Fuji TV March 28th, 2019. The 15-second clip was uploaded to Aniplex’s YouTube channel. The first season of The Promised Neverland is now streaming on Crunchyroll. Following the success of the animated film My Hero Academia: Two Heroes, there’s another movie based on Kohei Horikoshi’s popular manga on its way to Japanese theatres this coming winter. Promotional art for My Hero Academia: The Movie was uploaded to Twitter today, featuring Bakugo as a kaiju while a horrified Midoriya, Ochaco, Iida and Todoroki look on. A brief 15 second spot was also posted to YouTube earlier this week. MV Queen of New Westminster manoeuvres into Duke Point in Nanaimo. With some of BC Ferries’ older vessels reaching the end of their life, the company is looking for input on the amenities and features for the next generation of vessels. BC Ferries is hosting both an online survey and in-person pop-ups on select sailing routes between Metro Vancouver and Vancouver Island. These new vessels would replace four serving the routes between Metro Vancouver and Vancouver Island: MV Queen of Alberni, MV Queen of New Westminster, MV Queen of Coquitlam, and MV Queen of Cowichan. These vessels serve on the Tsawwassen-Swartz Bay, Tsawwassen-Duke Point and Horseshoe Bay-Departure Bay routes. BC Ferries is looking to maintain fare affordability, minimize environmental impact, adjust capacity based on demand and services provided on board. Feedback regarding accessibility, people travelling with children, pets or using bicycles, as well as outdoor spaces, food/drink options and other conveniences is requested. The new ferries are expected to enter service in the mid-2020’s. My Hero Academia: Two Heroes Blu-ray/DVD Combo pack with limited-edition Deku button from Funimation. If you missed catching My Hero Academia: Two Heroes in theatres last year, you can now take home the Blu-ray/DVD combo pack on Tuesday, March 26th, 2019. Izuku Midoriya, hero alias Deku, a young hero in training, receives an invite to attend a Quirk expo with his idol All Might. At the event, Deku encounters Melissa, a girl who had a similar Quirkless upbringing. The fun doesn’t last as a group of villains override the complex’s security system, putting their evil plan in action. Can the heroes help stop these villains and save the day? The combo includes the feature film on Blu-ray, DVD and a digital download, an exclusive interview with the English vocal cast on Blu-ray and a Deku button (limited and only when purchased through Funimation’s web store). Hojo Hand-Crafted Samurai Armor Corps from Japan appeared at the festival in 2018. It just isn’t spring without a stop at the Sakura Days Japan Festival. Located in the beautiful VanDusen Botanical Gardens, this two-day event celebrates everything Japanese in a fun festival atmosphere. The gardens host this fair between 10:00 am PDT to 6:00 pm PDT on Saturday, April 13th and 10:00 am PDT to 5:00 pm PDT on Sunday, April 14th, 2019. Spend the weekend with Japanese culture through live performances, music, food, arts, demonstrations and crafts and more under the budding pastel sakura — the Japanese cherry blossom. Two performers from Japan are scheduled to attend: taiko drummer Keita Kanazashi and shamisen players KiKi. As the festival takes place in the outdoors, bring appropriate attire as it may rain or the fields might have mud. Parking is limited, so save the hassle and take transit (either the #17 bus, or walk from the Oakridge-41st Avenue Canada Line Station west along 41st Avenue, and then north along Oak Street) to reach VanDusen Botanical Gardens (about a 15-20 minute stroll). Paid admission is required for entry; tickets are available for purchase online (includes discount) or in person at the door. There’s another anime series based on Hideaki Sorachi’s manga Gintama that’s under development according to a tweet by official Gintama anime Twitter account. The news was also mentioned at the Gintama Shirogane Matsuri 2019 event on March 3rd, 2019 in Tokyo, Japan. No date for the when the new Gintama anime would air was provided. 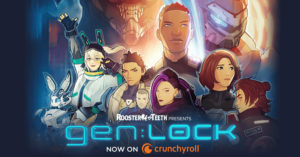 The first season of gen:LOCK, Rooster Teeth’s newest sci-fi/mecha animated show, is now available on anime streaming service Crunchyroll. The future of the world is at stake as a brutal organization seeks to conquer it. Despite this, humanity’s last hope lies with a squad piloting mechas using weaponized neuroscience; utilizing this power means they need to cede everything they have to to protect the planet. There are eight episodes in the first season, with an all-star cast including Michael B. Jordan, Maisie Williams, Dakota Fanning and David Tennant. The animation and intense action will keep you on the edge of your seat wanting more. To celebrate the 20th anniversary of Digimon, a new film, tentatively titled Digimon Adventure, is in the works and expected to screen in Japan sometime in early 2020. Promotional artwork drawn by Kazuaki Nakatsuru for the upcoming film shows Taichi Yagami standing with his Digimon, Agumon. Taichi, now older than when the franchise started, is clutching his trademark goggles in his right hand, while holding Agumon’s in his left.